I've created a puzzle quite a while back, unfortunately not many people wanted to play so I'm posting here instead. The first step is to figure out how to read the numbers, Joe already figured one part of the first step. The answer of the puzzle will be in text form. Hope you guys enjoy my game. Any comments on the puzzle is greatly welcome as well. As Joe commented, the numbers seem to get larger as you move around the circle's edge like a clock face. Then the "hint" says "divided by their seat". 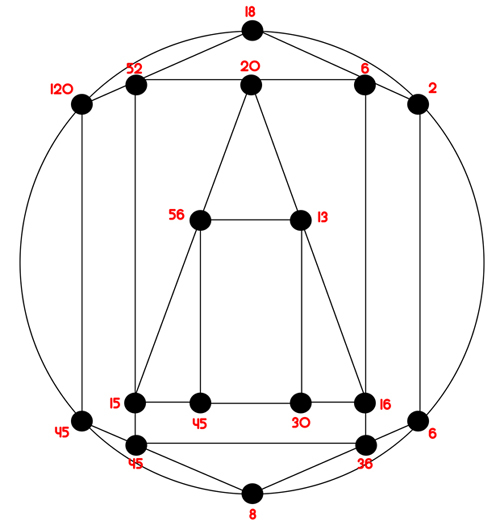 So if the numbers are getting divided by something, and what they're divided by gets bigger as you move around the circle, the seat must be something that gets bigger as you move around the circle. Next, starting with the 18 and moving clockwise we can see that each number is divisible by its position in that circle. So that's probably what seat means- position.